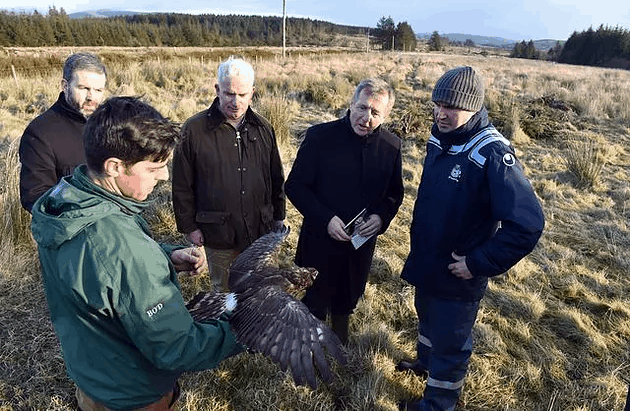 The Minister for Agriculture, Food and the Marine, Michael Creed T.D., today announced the opening of the new €25m Hen Harrier Programme under Ireland’s Rural Development Programme. The Minister made the announcement on a visit to the farm of Jack Lynch, who farms in the Hen Harrier SPA near Ballyvourney, outside Macroom, Co. Cork. The design of the Programme was influenced by a combination of conservation NGO and researchers working together to deliver a targeted landscape level intervention which places the farmer at the heart of the process. Farmer consultation was a key element of the development process for the programme and the opinions and feedback collected from 500 farmers were incorporated into the final design. Creating sustainable farming systems that work for both the farmers and the bird, and deliver real socio-economic benefits to the areas concerned, is a major objective. The programme is targeted specifically at farmers with designated land and should provide farmers in the SPA hen harrier areas. The programme is a pilot project under the European Innovation Partnership measure of the Irish Rural Development Programme. The programme is designed and administered by a Hen Harrier Project Team under the leadership of Fergal Monaghan. An extensive team of raptor specialists, fieldworkers and farm advisors will support the roll-out of the programme on the ground, and the Department of Agriculture, Food and the Marine, with the National Parks and Wildlife Service of the Department of Culture, Heritage and the Gaeltacht, will help guide and support the project. “We started this week with the major Food Wise Conference discussing sustainable agriculture in balance with the environment. Today we can see this in action with this Programme, which shows how Irish farmers working in tune with the environment can help to save one of our most endangered species”, Minister Creed said today.